Odin Gaming is a blog about strategy and simulation gaming. Found here are mods, guides, and stories for these, my favourite of game genres. In the case of modding, I’ve always found the communities to be a little disparate from one another and generally in need of some cross-talk. Modding can also be a little impenetrable to someone just starting down that path, so Odin Gaming aims to provide some help on that front. It’s also just a way to say thanks to those hordes of contributors who modify their favourite games and share their work with us with no expectation of compensation. My name’s Ash. I like gaming. This hobby was a gift from my grandma; I’m relatively certain my first exposure to video games was Manic Miner on the ZX Spectrum. I remember my grandma buying Mario Bros 3 for the NES and sitting with me for hours as we played Super Metroid or Ocarina of Time. Yes, Nintendo was my first gaming love. I started dabbling with strategy games in my early teens with the likes of Civilization III, Cossacks, and Empire Earth. RTS grabbed me more than TBS at this stage in my life, but my genre of choice was FPS; it was difficult to avoid when all my mates were playing Halo. I spent a decent amount of time playing RPGs too, with the Elder Scrolls titles taking pride of place. As I got older (still only mid teens), I took RTS games more seriously. Dawn of War, Supreme Commander, Age of Mythology, Star Wars Galactic Battlegrounds… to name a few. The RTS to TBS transition was mostly seamless and I certainly find myself falling more heavily on the side of TBS games these days. TBS, 4X, and Grand Strategy have the bulk of my gaming attention today. I think I like the slower pace; the ability to move away from the game at will to deal with whatever else is going on around me. I like the need to think deeply about my actions. I enjoy how my imagination is sparked by the worlds that I create in these sorts of games. There’s little need to list my current favourite gaming titles because they’re featured all over this site! I think – and I’m trying my best to cast my mind back here – my interest in modding started with The Elder Scrolls III: Morrowind. I originally owned this game on the XBox, but had a friend who had joined the PC Master Race a little earlier than me. He showed me console commands and the power of editing game files to do pretty much whatever you wanted. At this point in my life, I was just interested in giving myself super-elf abilities. This, however, opened me up to the world of modding. I’ve always been more of a consumer than a creator in this regard, but have acquired quite a taste for it. The power to mould a game that’s already appealing to be just so is one that’s difficult to overstate. When I’m not gaming – or blogging about gaming – I work as a senior software engineer for an online marketing company called dotdigital. Software engineering grew out of a hobby; I didn’t study it. I graduated with a master’s in Materials Science and Metallurgy from The University of Cambridge, which is useful mostly for the occasional (riveting) conversation. My interest in the natural sciences has stayed with me and I spend a decent amount of time reading some of the revelations that continue to come out of the scientific community. Other than that, I love to walk. I come from the Cotswolds in the UK which, in my opinion, is the most beautiful place in the world. Having done a good amount of travelling, I feel quite confident in this assessment! Hill walking is a popular pass-time in the Cotswolds and something that my family encouraged. Every site owner will have their own favourite combination of technologies. Here’s mine. The advantages of using WordPress go without saying. Administration is easy, support is plentiful, and the massive number of plugins is astounding. For someone just embarking on the web design journey (like me), it’s perfect. I use a WordPress theme called YouPlay by _nK. The creator is incredibly responsive to support requests and has dealt with every one of my (many) support tickets so far with speed and finesse. The theme also looks amazing, if I do say so myself! The header and footer backgrounds are the amazing work of Shane Watson. Check out his site, Oregano Productions. 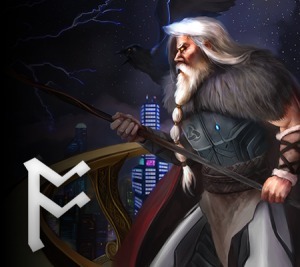 The Odin Gaming logo is a simple reproduction of the Old English rune ós. The font used for the header title is free for commercial use and is Vanadine by Axel Lymphos. The site is hosted by SiteGround. (That’s an affiliate link, meaning I’ll earn a commission for any conversions made through it.) Having dabbled for a period with DreamHost, I noticed an immediate difference in page load speeds using SiteGround. The support team are at hand 24/7 with live chat and they’re awesome; not only will they advise on possible solutions to your problem, they’ll very often carry out the fixes for you on the spot. This is my first attempt at monetising this blog in a manner that’s not too offensive to readers and, in fact, I hope it’s done in a way that’s beneficial to them. All products are hand-chosen and their placement on the site curated by me for an international audience. To embed the referral links in my posts and pages, I use the Amazon Affiliate for WordPress (AAWP) plugin. (That’s an affiliate link, meaning I’ll earn a commission for any conversions made through it.) A responsive developer and regular updates have made this a pleasure to deal with. There’s a lot of power in the shortcodes for this plugin and the ads look great!